Verdant Garden Beds are 18" tall allowing ample room for most plant roots to grow. 2' x 7.5' configurations are perfect for small plots of flowers and vegetables. Buy multiple beds and create different environments for each of the plants soil and sunlight needs. 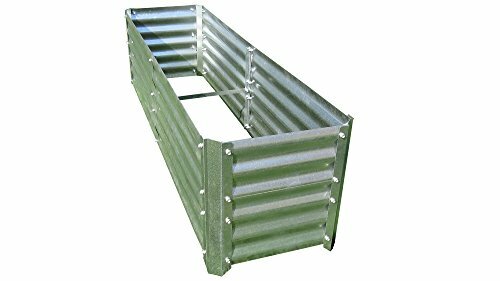 For the beginner to expert gardener, these strong steel garden beds give you control over soil and drainage preferences. For a great looking flower bed or garden, create a rustic new look to a familiar tradition. Please review your package upon arrival. Notification of missing parts must be given within three days of receiving Verdant Garden Bed shipment. This product does not qualify for returns. Please make sure this product is the correct size and will work for your space before purchasing. If you have questions or concerns, please contact our Verdant Garden Bed Customer Service Team at 1-800-557-4689. If you have any questions about this product by Verdant Garden Bed, contact us by completing and submitting the form below. If you are looking for a specif part number, please include it with your message.